Making It As A Middle School Teacher: Math Game Monday ~ What's My Sign? Math Game Monday ~ What's My Sign? 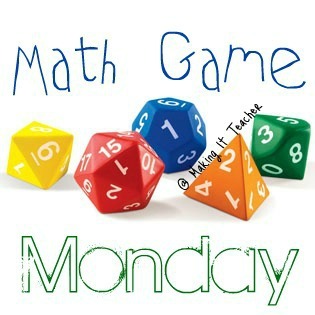 I really, really like this week's Math Game Monday!! 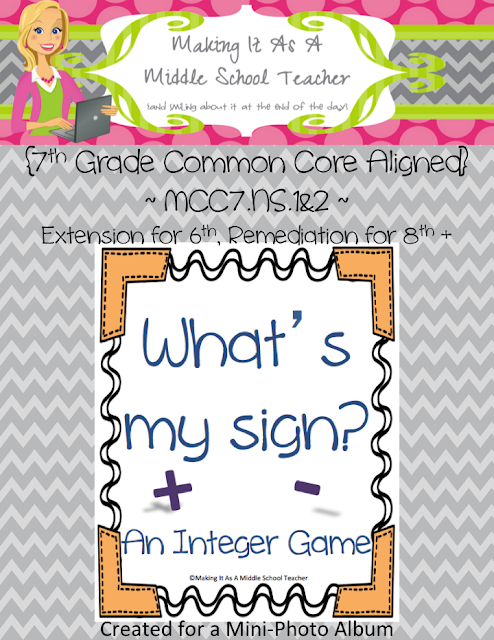 It's another Math Station designed to fit in a mini dollar store photo album on...INTEGERS!!! I think students need to practice integers all year long. If not, the long-term storage of the rules and the necessary comfort level for the student just isn't there. AND integers play such a huge role in future concepts students are expected to master!! This math station/center is designed to be cut and placed into a mini photo album like the $1 versions from The Dollar Tree or Wal-Mart. I've included pictures of my completed book so you can see an example. I removed the album covers that were included and added plain white card stock cut to the same size in their place. 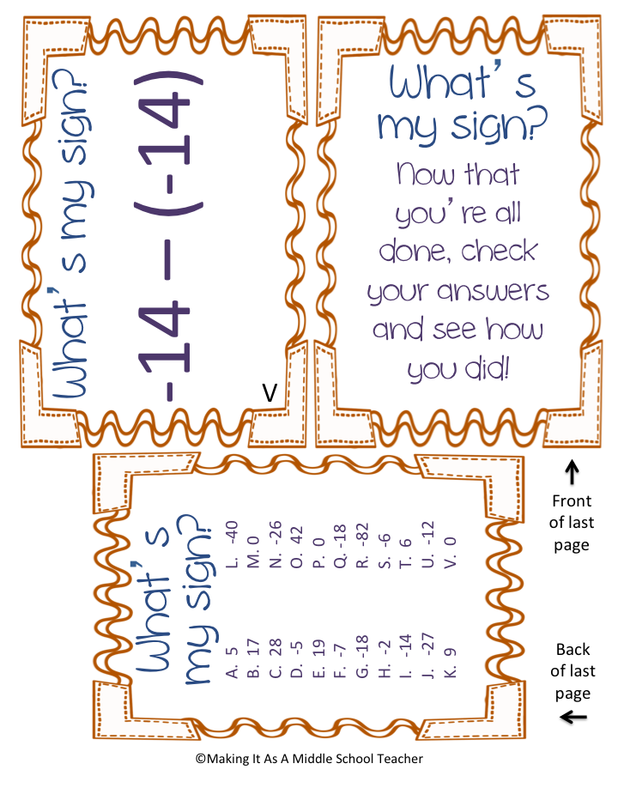 Then just add the cards from my set and you have a neat little math station mini-book!! The 22 Cards contain addition, subtraction, multiplication, and division integer problems. Extra blanks are included in case you need to change out some cards or add more. I've included an entire set in color to print on white card stock and an entire set in blank line to print on white or colored card stock. My example in done on colored card stock to add interest while saving on ink costs. 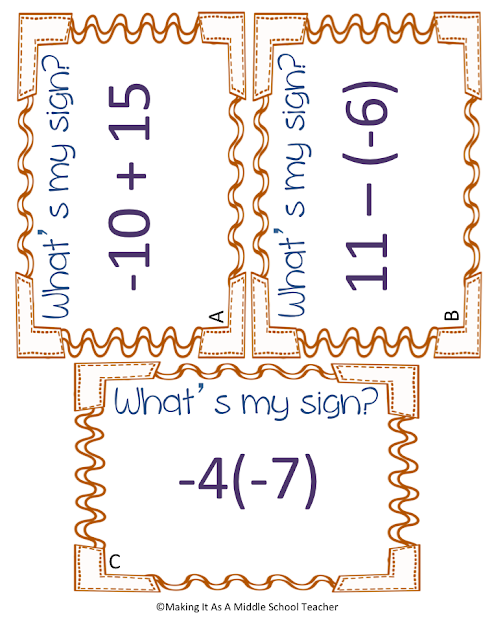 Making this into a mini-book provides a different, unique way for students to complete a math station. This can be done individually or with a partner. This is also an excellent option for an Extension for 6th graders or a remediation for 8th graders. 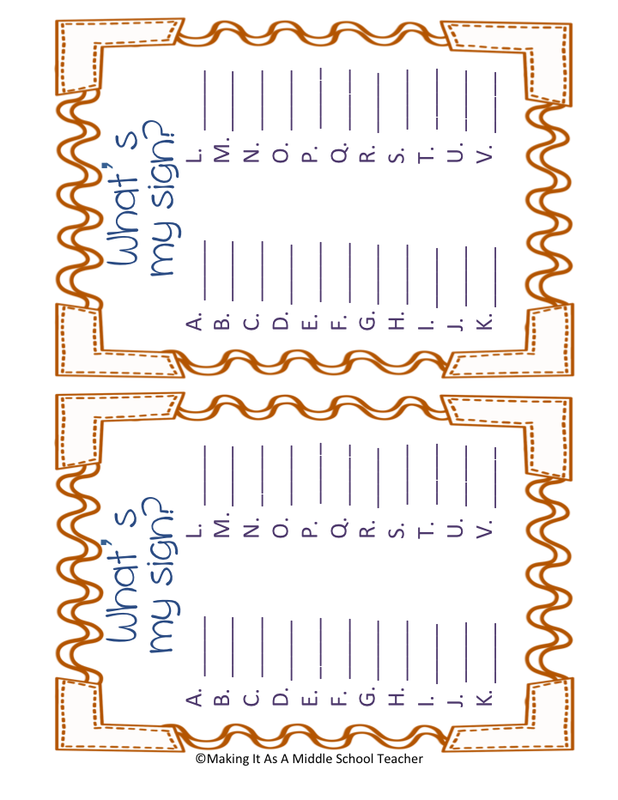 I hope you find this product very useful in your classroom! By now, you know the deal. The first 3 people to leave a comment and include an e-mail address will receive this game as a little gift in your inbox tonight! 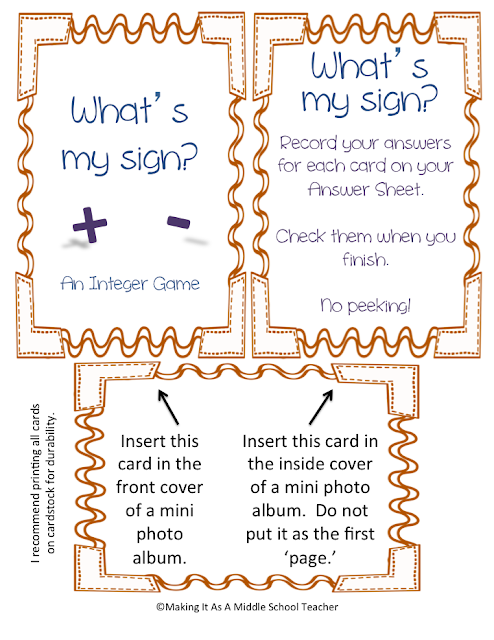 Such a cute idea - we just finished integer operations and can't really say everyone got it. This would be great for those that didn't to get some extra practice. What type of program do you use to create all of the amazing backgrounds and stuff?? I usually use PowerPoint for most things. TPT is a great source for backgrounds, clipart, etc. It just takes sitting at the computer and playing around with it. What a great idea. I cannot wait for my students to try this. I would love to have several versions for students that always seem to finish early. Thanks for the motivation to get creative. Thank you, Elaine, for the sweet words! I love this idea! You have my mind spinning with algebra ideas! So glad you stopped by! I LOVE your stuff! So many possibilities with this set up. Sorry you're having trouble posting. I'm not sure what to suggest. However, you are the 1st to leave your e-mail address, so your copy is own it's way shortly! I'm so glad my products are being out to good use! You're the 3rd comment to leave an e-mail so you are a winner! I just finished a blog post on "Pop Culture in the Classroom". "What's Your Sign" is really in keeping with my theme of bringing what the kids know outside the classroom into their learning environment. I really like this idea. If you'd like to read about how I am using pop culture in my classroom visit new-in-room-202.blogspot.com. 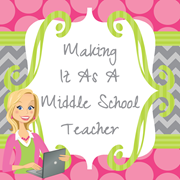 I just commented and forgot to leave my email: jai.harden@tipton.k12.ia.us. 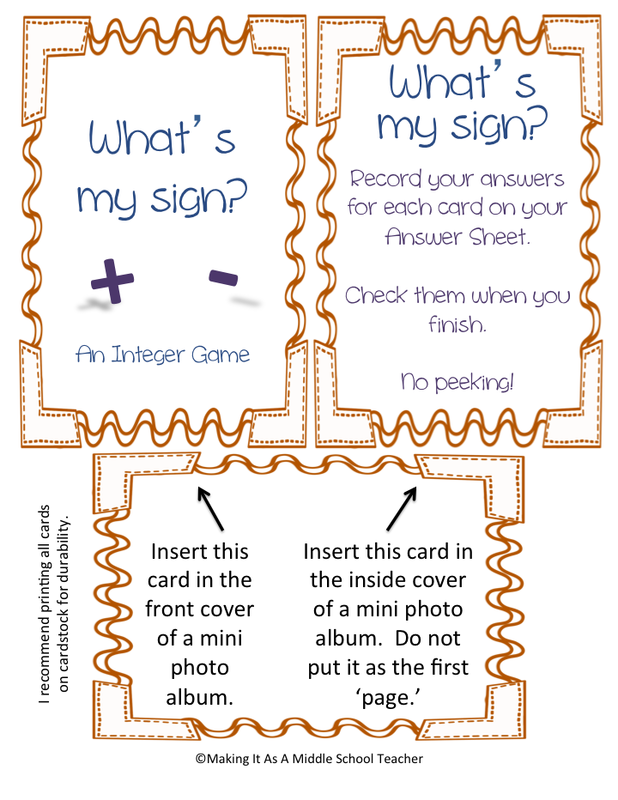 I would love to use this integer game with my 7th graders!! Hi. How would I get a copy of this now? I love the idea and see many uses for it! I am interested in a copy of this, too. Please tell me how to get it. Thank you! I would love to do this with my remediation kiddos! How do I get a copy? You Rock! Barbara's Sunday Visit ~ Taking Care of Yourself! Are You Ready For the Sales??? Cyber Monday...PLUS Tuesday! It's Coming!!! Thankful Linky & A Winner! 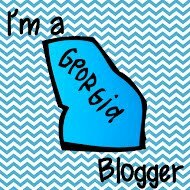 Sunday Samplings ~ Freebie Frenzy & A Winner! Sunday Samplings ~ A Real Hodge-Podge!! !